What's Your Sales Acceleration Formula? Last February I was in serious discussions with Mark Roberge, Chief Revenue Officer at HubSpot, about co-authoring a book. At my request, he sent me several lengthy articles he’d written. The minute I saw them, I realized the man was brilliant – and needed to write a book of his own. And he has – The Sales Acceleration Formula just came out! Here’s the fascinating part. Mark’s an engineer and MIT grad. He’s never been in sales. Yet HubSpot’s two founders brought him in to develop “scalable, predictable revenue growth.” In just a few short years, this start-up grew to $100 million in revenue. Mark’s unconventional strategies played a big role in making that happen. Every sales leader and entrepreneur can learn a ton from his approach. I hope you enjoy my interview with him. JILL: Mark, there’s a theme that runs through your entire book – and it’s why I love it. You never accept prevailing sales wisdom at face value. Instead, you use it as a starting point. And then your engineer takes over. Can you share how you tackle all these sales challenges you write about in the book? MARK ROBERGE: I believe the tactics fueling optimal sales execution differ from company to company. Before engineering the optimal sales processes, an organization first needs to appreciate their unique context. How do your prospects prefer to buy? How complicated is the sale? Should customers be acquired through inside sales, outside sales, or through partners? The answers to these questions differ from company to company… and so should the sales strategies that are implemented. Unfortunately, this perspective is not often natural for many sales leaders. Instead, upon joining an organization, these sales leaders simply look to replicate the execution strategy that succeeded in their last environment. Unless you get lucky and the contexts are remarkably similar, this approach can be problematic. JILL: What kind of research or due diligence did you do to come to these conclusions? MARK ROBERGE: My first year running sales at HubSpot, I probably had coffee with 30 or so sales leaders. I inquired about their strategies around hiring, training, and managing their sales teams. I asked about demand generation, forecasting, and sales methodologies. I found some of their tips applicable. However, many were not. So much has changed from 1995 to 2005 to 2015. Today’s buyer is far more empowered, largely due to the Internet, and doesn’t want to deal with the often perceived slimy tactics of traditional salespeople. Furthermore, as more and more sales organizations transition to an inside sales model, enormous productivity gains can be realized by better leveraging data, process, and technology. I wanted to build a sales organization with these new realities as its foundation. However, I didn't know how. Instead, I honed in on the solution by following an experimental model that closely resembles the scientific method. As we identified the areas of a traditional sales organization we wanted to innovate on, we formed theories, devised experiments, measured the results, learned, and iterated. Overtime, the “formulas” for success within our business emerged. JILL: In The Sales Acceleration Formula, you use this methodology to find top sellers, to determine the best training program and much more. Do you have to be a rocket scientist to do this? Or can normal human beings implement this approach? MARK ROBERGE: The concepts are for everyone. They are simple frameworks that are applicable, even if you are only hiring 2 sales people or trying to grow revenue to six digits this year. Yes, there are times when I geek out and take things to a level that is probably not necessary for most organizations, as not everyone is trying to grow to $100M in revenue. However, the main concepts are applicable at any stage. The point here is to keep things simple and predictable. The major shifts in buying behavior and sales strategies I mentioned earlier have enabled us to codify aspects of selling that have been traditionally written off as an “art form”. JILL: I love that! Codifying the "art form" of sales! Are you ever surprised by the results? And if so, can you give me an example? MARK ROBERGE: All the time. The hiring results were probably most surprising. Over the years, I and my hiring managers scored every single sales candidate against a set of ten or so criteria. Every 6 months we'd study the correlations between the scores observed at the interview stage and ultimate performance as new hires matured in our funnel. I was surprised to see that skills typically associated with salespeople, such as closing skills, objection handling, and aggressiveness, were negatively correlated with performance. And skills typically associated with great advisors, such as intelligence, passion, and curiosity, were strongly correlated. This result was quite revealing as to the types of salespeople today’s empowered buyers want to work with. JILL: I totally agree with what your scientific methods uncovered. Let’s talk about how you source top sellers. In your book you state that, “World-class sales hiring is the most important driver for sales success.” Why? And, how did you determine what that was? MARK ROBERGE: When I first started building the sales team, HubSpot consisted of four guys in a garage near MIT. We had zero resources. As the person responsible for sales, I framed my role as hiring, training, and managing great salespeople. However, I knew I couldn't do an A+ job on all three. Doing so would require a 150 hour work week. After some reflection, I theorized that I should do an A+ job on hiring and get by on training and managing. I figured if I hired mediocre salespeople, having a world-class training and management program would not matter, as I would be faced with a continual uphill battle. However, if I brought on rock star salespeople, it may not matter if my training and management program was sub-par. Rock stars will always find a way to win. I think most people agree with this theory. However, it is so easy to overlook when you are in the thick of execution. JILL: I totally understand that. Everyone wants rock stars, but finding them can be a real challenge. So what exactly did “world class hiring” mean to you? MARK ROBERGE: I wanted a scalable, predictable hiring process centered around the characteristics that were historically proven to lead to success in our organization. I also wanted us to proactively recruit passive sales candidates as opposed to waiting for people that were active in the market. Most great salespeople have an open-ended job offer from all of their past bosses. Waiting for them to come to you is not realistic. JILL: Smart thinking. So what factors were you looking for? What defined a HubSpot rock star? MARK ROBERGE: The five criteria that correlated most strongly with success at HubSpot were ...Coach-ability, Curiosity, Intelligence, Work Ethic, and Prior Success. We used the process I outlined earlier to determine these criteria. JILL: Do you think that every sales organization should use these same criteria? It sounds like an ideal candidate. MARK ROBERGE: No! That is a key point. Context especially applies in the area of hiring. People always ask me, “what do you look for in a sales hire?” I can tell you but it is somewhat irrelevant. My ideal criteria applies to a software company selling over the phone to business owners and marketing leaders aF product costing hundreds or thousands of dollars a month in the early part of this decade. That is the context of my answer. Chances are, your selling and buying context is far different and, as such, the ideal sales candidate you are looking for differs as well. However, the process of engineering your ideal profile is the same. Be disciplined up front about theorizing on the five or ten criteria that you believe will yield success for your company. Be disciplined about clearly defining the criteria and the quantitative levels that will drive your scoring mechanism. Be disciplined about scoring each candidate and especially each hire. Even if you only hire two or three people this year, go back to those scores and reflect on the patterns of success or failure. Iterate accordingly. JILL: Thanks a million, Mark. I truly appreciate your time today. We've only had a chance to talk about one section of your book. Can you give us a quick overview? MARK ROBERGE: Sure. Here are the five topics I cover in The Sales Acceleration Formula. JILL: And, I have to say, the entire book is a fascinating read. I strongly recommend it to anyone who's leading a sales team or building a company. It's filled with tons of great advice. 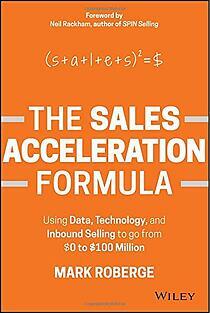 Click here to get your copy of The Sales Acceleration Formula on Amazon. It's worth reading.